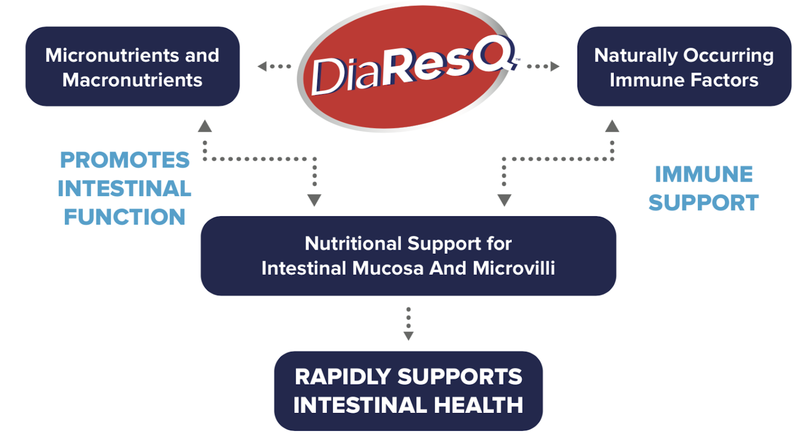 DiaResQ® is a Food for Special Dietary Use that contains immune factors, micronutrients, and macronutrients that work with the body to address the underlying cause of diarrhea — not just the symptoms. Formulated from naturally-derived ingredients that contain immune factors, micronutrients, and macronutrients to rapidly restore normal intestinal function. The first milk of dairy cows, bovine colostrum is rich in nutrients, immune factors, and protective proteins. Provides a high-quality source of bioavailable protein and immune factors. When mixed in water, the components of DiaResQ form a macromolecular emulsion that protect its bioactives from acid degradation in the stomach. 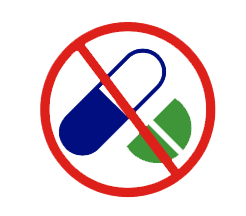 Patients can use their pharmacy benefit when purchasing DiaResQ with a prescription. 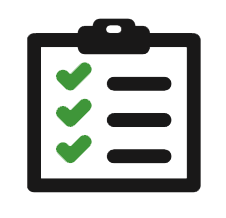 DiaResQ is also eligible for Flexible Spending Accounts and Health Spending Accounts with a prescription. 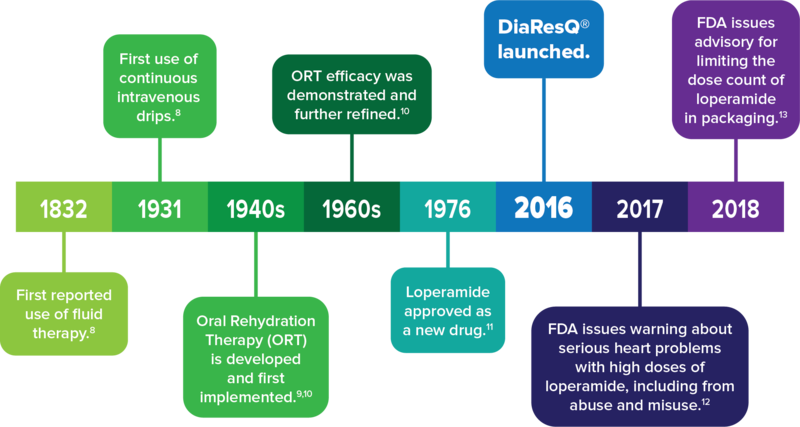 DiaResQ was recognized as one of thirty leading healthcare innovations with great promise to transform global health by 2030 and to help accelerate progress toward the United Nations Sustainable Development Goals health targets. 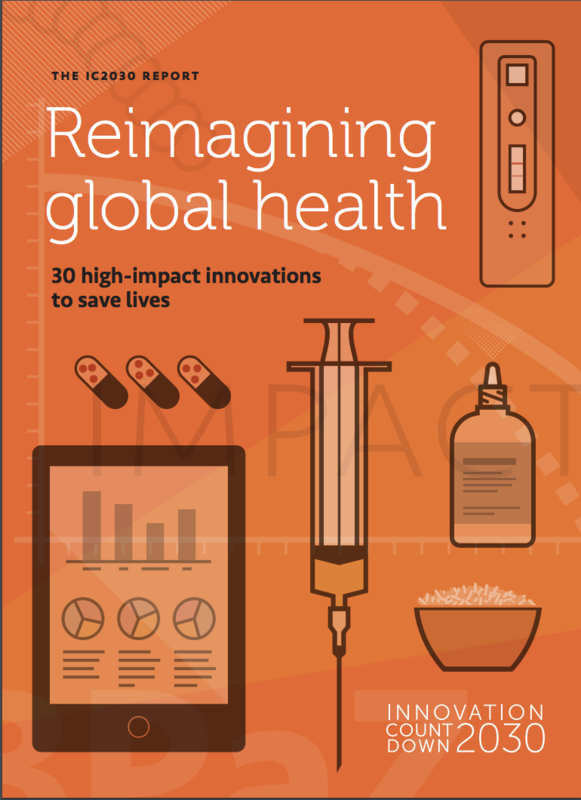 Reimagining Global Health showcases technologies and interventions with great promise to accelerate progress toward solving the world’s most urgent health issues. Produced by PATH, the report is supported by the Bill & Melinda Gates Foundation, the US Agency for International Development (USAID), and the Norwegian Agency for Development Cooperation. References: 1. Gaensbauer JT, Melgar MA, Calvimontes DM, et al. BMJ Glob Health. 2017;2:e000452. 2. Data on File. Pantheryx Inc, Boulder, CO. 3. DuPont, HL. N Engl J Med. 2014;370:1532-1540. 4. U.S. Centers for Disease Control. CDC Yellow Book 2018: Health Information for International Travel. Oxford University Press, 2017. 5. U.S. Centers for Disease Control. MMWR Morb Mortal Wkly Rep. 1992;41:001. 6. Chassany O1, Michaux A, Bergmann JF. Drug Saf. 2000;22:53-72.7. Friedman AL. Kidney Int. 2005 Jan;67:380-388. 7. Friedman AL. Kidney Int. 2005 Jan;67:380-388. 8. da Cunha Ferreira RM and Cash RA. Clin Ther. 1990;12 Suppl A:2-11; discussion 11-3. 9. Ruxin JN. Medical History. 1994;38:363-397. 10. U.S. Food and Drug Administration. [email protected]: FDA Approved Drug Products. 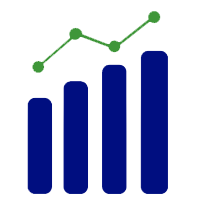 Available at https://www.accessdata.fda.gov/scripts/cder/daf/index.cfm?event=overview.process&applno=017690. Accessed August 14, 2018. 11. U.S. Food and Drug Administration. FDA Drug Safety Communication. Available at https://www. fda.gov/Drugs/DrugSafety/ucm504617.htm. Accessed August 14, 2018. 12. U.S. Food and Drug Administration. FDA Drug Safety Communication. Available at https://www.fda.gov/drugs/drugsafety/ucm594232.htm. Accessed August 14, 2018.